Dr. McCoy (Bones) (Item No. 51200/3), chief medical officer and third-in-command of the Starship Enterprise, as portrayed by the late DeForest Kelley. The head sculpt on this figure is a beautiful likeness of the actor, only slightly entering the realm of caricature. 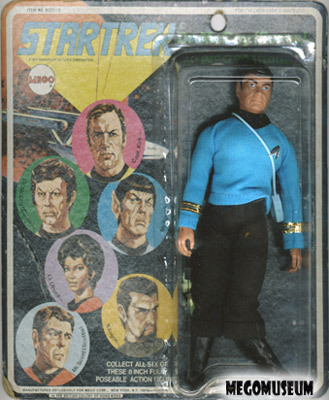 The Dr. McCoy figure went through four distinct face incarnations. The first was a Type 1 head (lighter flesh) with light-pink detailing on the lips, and chocolate-brown hair/eyebrows (left). The next was a Type 1 head (lighter flesh) without lip paint, and with chocolate-brown hair/eyebrows. The third head was a Type 2 head (darker flesh) without lip detailing, and with chocolate-brown hair/eyebrows. The fourth and final head was a Type 2 head (darker flesh) without lip detailing, and with black-brown hair/eyebrows (nearly the same color as Scotty’s hair/eyebrows) (right). This fourth head appears ONLY on “Blank-Back” specimens. The first is certainly the rarest, while the third is, by a sizable margin, the most common. 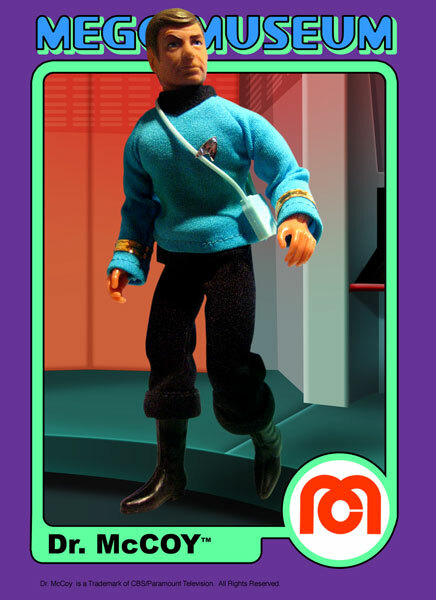 Here we have a Dr. McCoy on a “5-face” card. 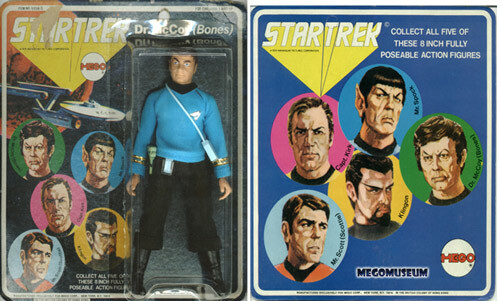 Dr.McCoy on a “6-face” card with the name in white lettering. Here we have a Dr. McCoy on a “6-face” card with the name in green lettering. Here we have the infamous “Blank-Back” Dr. McCoy Sears re-release (Item No. 91221/3). “Blank-Backs,” being later releases, were notorious for the inferior plastic used in their manufacture. Luckily, it seems that this specimen has been spared the all-too-common fate of a broken leg (or perhaps it simply hasn’t been shaken enough yet to reveal the flawÉ). Also note the “white-edged” foil insignia, presumably heat-sealed (an insignia method Mego began implementing in the late ‘Seventies). Here we have an interesting transition piece: a “Blank-Back” Dr. McCoy with the more traditional two-part foil stick-on insignia. Again, note the broken leg. 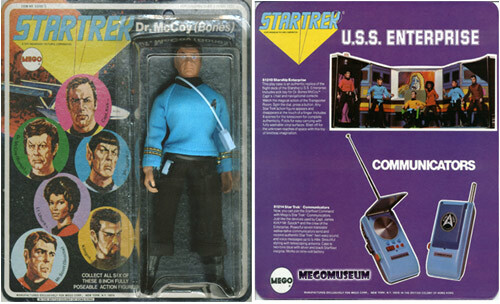 McCoy wears the same blue science division shirt as Spock and it has been factory reproduced by Doctor Mego and Emce Toys. The DM repro shirt fits a little more snug and is a little shorter. The collar is bigger, and the rank strips on the sleeves are a touch farther apart. The strips also have a slight texture, where the original has none. The shirt is marked DM on the inside near the collar. The Emce shirt is a little brighter blue than an original although the collar is much closer to the original in size than the DM counterpart. The rank stripes on the Emce shirt are a silver instead of the gold used on the original Mego shirts. 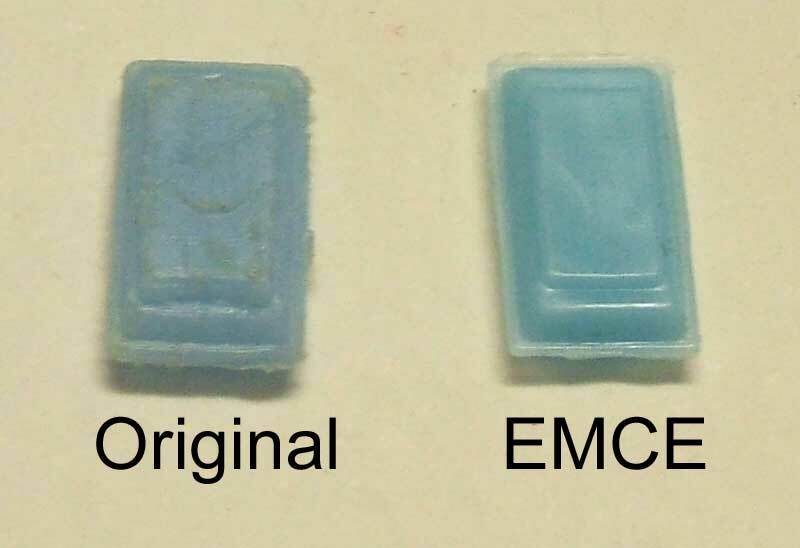 The Emce is unmarked. It should be noted the originals tend to “fade” green between the arms and the waist, creating a greenish ring around the shirt. The real giveaway is the material. The repros are made from the more modern, slicker material. Trek crew pants have been factory reproduced by Doc Mego. The reproductions are a little bigger and longer than originals, but otherwise close to the originals. They are marked DM on the inside. 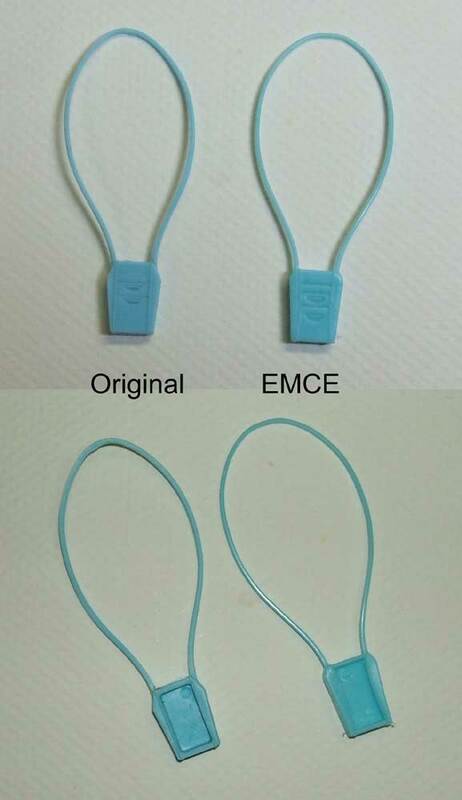 They have also been reproduced by Emce Toys. 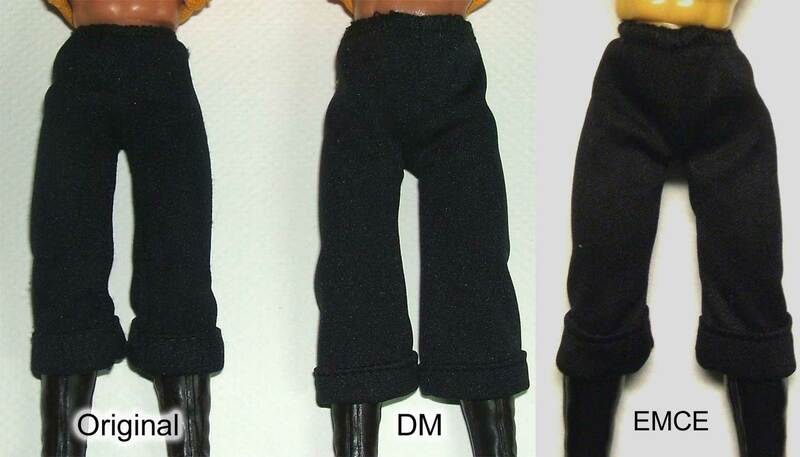 The Emce repro’s are almost exactly like the DM’s, but the cuffs are a little wider, making the pants a little shorter than Docs and original Mego pants. The Emce pants are unmarked. Both repro’s are made from a slightly slicker, more modern material than the originals. The Trek weapons belt has been reproduced by Doc Mego and Emce Toys. Both repro’s are identical and very difficult to spot. The reproductions have a very slightly more rounded look around the holsters, but even that is hard to see. Neither reproduction is marked. The male crew members carry a blue phaser. They are cast in the same color blue as the communicator, but the blue (especially the phaser) tends to take on a greenish hue over time. 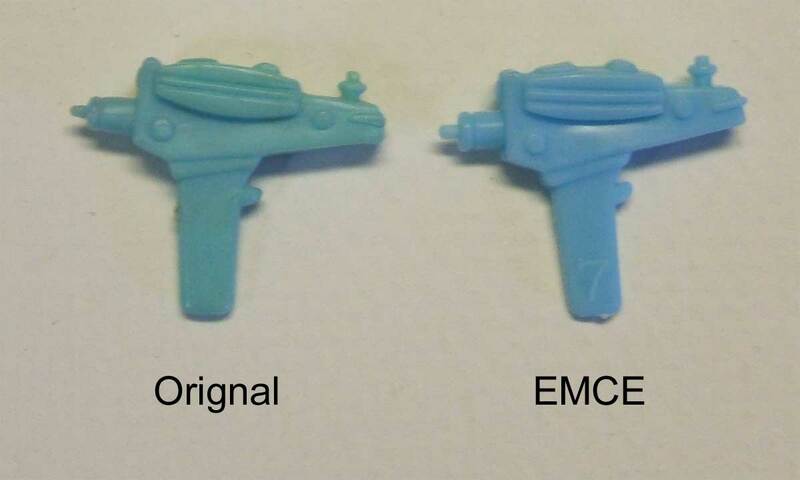 The phaser has been factory reproduced by Emce Toys. The repro is a brighter blue, the lines on the smaller phaser attachment are a little wider on the repro, and the post near the back/top of the phaser sticks up a little higher. The main body of the repro is a little wider, and the handle is just a touch more narrow, which makes the repro not stay in the holster on the belt. The Emce is marked with the number 7 printed on one side of the handle. What can be confusing about this mark is the repro phaser has a 7 on the handle and the original does not, but the repro tricorder is unmarked while the original has a 7 printed on the backside. Bascially what that means is the 7 mark does not mean repro on all Trek items. 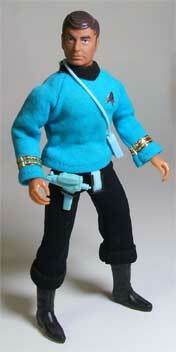 The male crew members carry a blue communicator as well as the phaser. They are cast in the same color blue as the phaser, but the blue (especially the phaser) tends to take on a greenish hue over time. 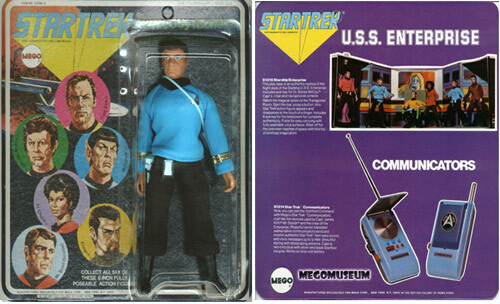 The communicator has been factory reproduced by Emce Toys. The repro is a brighter blue, and it is an overall cleaner cast than the original. One of the telltales of the repro is a thin bit of flashing that outlines the unit. The repro is unmarked. 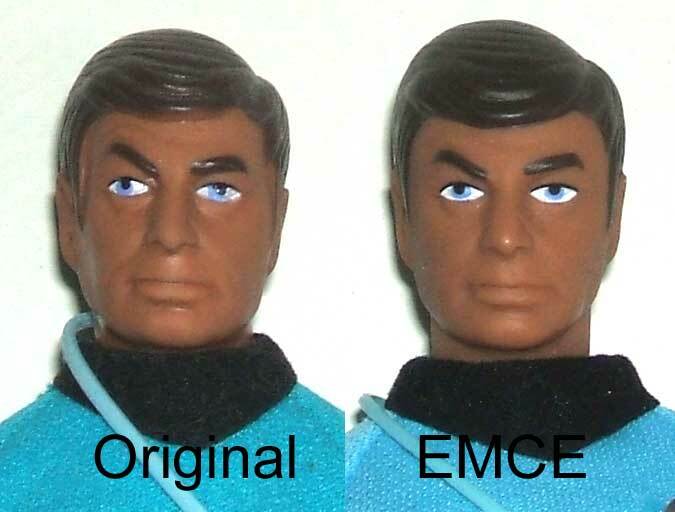 McCoy’s head has been factory reproduced by Emce Toys. The reproduction has some minor differences. The hair and eyebrows are a little darker color. The hair on the repro is a little taller and the chin just a bit more narrow. The eyes are painted just slightly different on the repro (see picture), and it is made of a firmer material so the head is a little harder. It is marked with a 2007 CBS copyright on the back of the neck.